It was during one of the Lowveld’s crisp winter mornings that I was on my way to Phalaborwa for my weekly shopping expedition. Phalaborwa was our closest town to get groceries and a 50-kilometer game drive away. I left early that morning, wanting to take advantage of the cool of the day. I also hoped to find some predators on the road. The tar road stays warm long after the sun goes down and lions love sleeping on the warm tar road during the cool winter nights. Just before Nlanganini dam, the road goes up a small hill and then bends left and down. I was just coming around the corner when I saw four sub-adult lions walking in the middle of the road. Seeing lions is always a treat. I mean who else can say that they get to see big five animals on their way to the shops? I slowed down and switched off my engine a bit of a distance away from the lions. They looked like they were on a mission and closed the distance between us quickly. I could see two of them were in a playful mood. One was biting the other one’s tail, he slapped her with his big paw. I just sat there and smiled. Then one of the lions, a young male, turned his attention to my car. He walked right up to the bonnet and then past my door not even an arm’s length away. He looked up at me and for a second it felt like those big yellow eyes were looking straight into my soul. 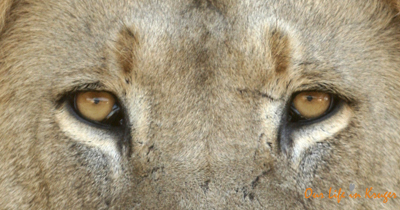 I cannot even begin to tell you what an adrenaline rush that is: to have a lion give you ‘the look’. It is fantastically awesome and bone-chillingly scary all at once! He gave my tire a good once over, and then carried on licking the back passenger door! I was keeping a close eye on him through my side mirror and all of a sudden I saw him wrap his jaws around the door handle! I could not believe my eyes! And quickly made sure the car’s doors were all locked! Imagine if they weren’t! Luckily I was safely locked inside the car and after slobbering on the door handle some more, the lion eventually lost interest and joined his three friends in their journey down the road towards Letaba. I watched them disappear below the rise in my rearview mirror with my mouth wide open! When I returned home later that morning, the lion spit had dried up with Kruger’s red dust sticking to it. Very clear evidence of the lion’s unusual interest in my car. What was it that he found so fascinating? I have no idea. Maybe I had driven through some buffalo or leopard poop. Who knows? But one thing is for sure: I proudly drove around Kruger with lion spit all over my car for weeks! Thanks, Gaynor! It was one of those very special days! That must have been an incredible experience. How lucky you are.. Pity it didn’t happen down south – you could have transferred the lion spit to your trail cam to scare off the monkeys!!! ;). Every time I read one of your posts I get more excited about our upcoming visit so thanks for keeping my adrenalin on a high! When are you coming to Kruger again? (I forgot, I’m sorry) I owe you a jar of marula jelly! Yes you’re right about the trail cam. After all they don’t try and eat the gate! Hi Linda. This reminds me of the day I had to leave early to go on a conference with the other staff of Hoxani College. Between Skukuza and Kruger gate was the pride of lions. One got a bit upset with me and tried to ‘smack’ the vehicle. They are impressive and BIG.